Like most kids these days (and most adults for that matter) my two sons read and loved the Harry Potter books. They wore the Halloween costumes, swung sticks like wands, and memorized dozens of hexes and curses from the movies and books. One night over dinner, I started teasing my kids that while magic is pretty cool, science and engineering are a lot cooler...because they actually work. Out of that discussion, and to prove a point, I decided to build a 'Magic' clock that actually works. 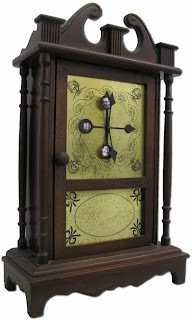 Like the Weasley's Whereabouts clock from the Harry Potter books, this clock tells the location of each family member by pointing an individuals hand to their "whereabouts" time. I spent some time searching for other projects and didn't find much. The few projects I found didn't look like the clock from the books and didn't capture my imagination. Planning and dreaming only go so far. Then you just gotta jump in and try. Feel free to explore further, ask questions, or make suggestions. I'll try to answer any questions and update the site with better pictures or more details if anyone wants them.